I'm back and I had a great time! I took more than 400 pictures but I'm not going to bother just yet, too tired. I have a pile of dirty laundry and 100 unread emails in my inbox. Torasham, Life Ramblings, Jacky, Nick, Mariuca, U.Lee, Metz, Hicham, Bombchell, and Azlan, thanks for your happy-holiday-wishes! I miss sitting on the beach. I miss the sound of the ocean. 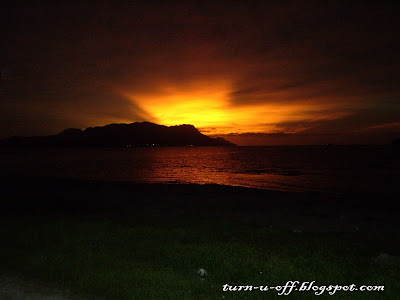 Sunset at Tanjung Rhu's beach. The setting sun turned me on. I just love sunsets and Sabah seemed to be well endowed with them. Gret picture of the sunset. welcome back monica! oh, you looked gorgeous and the sunset was absolutely amazing. ugh omg i hate checking my email, its that much, but its mostly from blogs lol, so its easier to check. Love the dress! :) You look gorgeous babe! Glad you had fun. WOW! Monica! You look simply hmmmm, beautiful! Love the pic. Me too, how I miss the beach, the smell of the sea, palm trees and moonlight nights, ha ha. Lee. Thanks ;-) I hope you're feeling lots better now! Monica!! pinjam ur dresss!!!! LOL! I love ittt I love ittt!! You look gorgeous babe! I love the picture you took of the sunset! i love the beach! Sooo sorry, I have typed your URL wrongly. Hahaha I am getting old. Better pack and go for a holiday like you and refresh my rusty mind.